I’m not a yarn snob. I’ve been called that more than once and I’ve always found it vaguely offensive. I’m offended for myself, because no one like to be called snobby. I’m offended for everyone who uses inexpensive yarn because there is nothing wrong with that. And I’m offended for the yarn (which I realize is perfectly ridiculous but there it is). 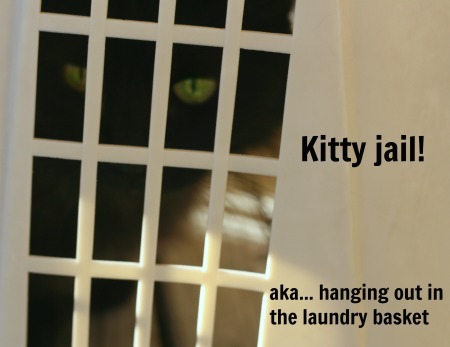 There is a good use, and a perfect project, for every single kind of yarn on the market. Hand dyed, expensive, one-of-a-kind, yarn makes for lovely shawls and terrible dishcloths. Scratchy acrylic that costs less than 50 cents an ounce makes terrible socks, but it will make the best, long-lasting floor mat you have ever seen. There is no such thing as bad yarn because all yarn is yarn and therefore good. (I feel the same way about coffee, fyi.) 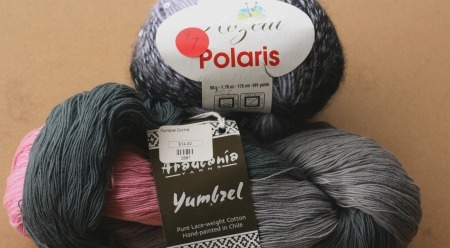 Being called a yarn snob makes me want to launch into a lecture about all this and about how we should have a wide variety of types and quality in our stash so that we can cast-on for any sort of project at 2:38 AM if we feel like it. I’m not a yarn snob, I’m a yarn addict and I have the stash to prove it. I’m kind of greedy about my yarn. I want it all. The cheap, the expensive, and the in between; its all mine. This ball of yarn from Walmart is going to grow up to be a shrug. Maybe. That’s what I was thinking when I bought it anyway. Shrugs, the kind that fit tight across the back, have to be a bit tough because there is some pulling and some strain around the shoulders and the underarms. A soft but durable acrylic the perfect yarn for that. 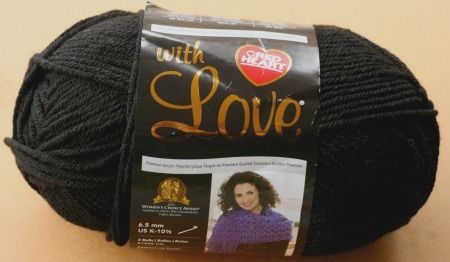 And even if I never make the shrug, its always nice to have some basic black yarn on hand. I may have to go back to Walmart and buy more. At the other end of the yarn-y spectrum is hand dyed yarn from local dyers. I’ll buy this stuff with no purpose in mind whatsoever. I just want the colors. 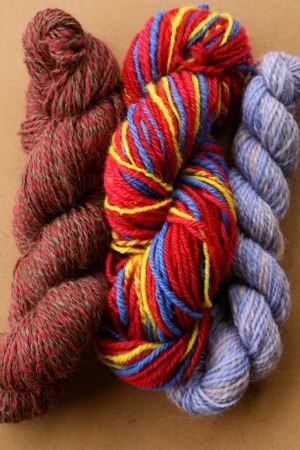 You know how it is with hand dyed yarn; if you pass up an opportunity to buy it you may never get another chance. So you buy it, right? Right. I do too. 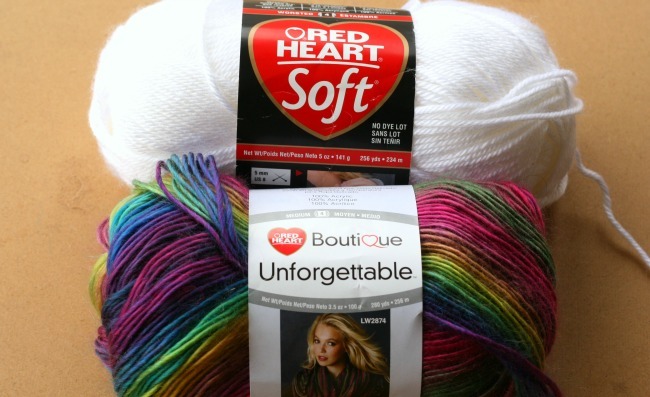 Then there is the specialty brands of yarn that you can find at a local yarn shop. If I’m going to a yarn shop, I’ll probably buy some because that is the whole reason I went in there first place. If I can find some good stuff in the sales bin I consider that an “official bargain” and I buy all of it. Or I buy as much as I can with the cash in my wallet. For me, yarn stores are like Las Vegas. I’m allowed to spend my cash and after that no more. No breaking out credit cards. Having all of these commercial yarns is not enough of course and so I must spin my own. Maybe this is why certain people assume I’m a yarn snob. Maybe they think I’m just too good for store bought and have to have hand-crafted yarn in order to be happy. That could not be further from the truth. Most of my hand spun goes into a drawer and sits there. As I’m spinning, I never know what I’m going to make with the yarn. After the yarn is made… I still don’t know what to do with it. So it goes into a drawer until I can figure that out. It sits in there for years sometimes while I knit and crochet with cheap stuff I bought at a store. Which bring me back to the original point of this whole rant. I like that cheap stuff from the store. I like it just as much as the handspun stuff I can’t figure out what to do with. So, after I got my feelings hurt from being called a yarn snob, I defiantly picked up some cheap stuff and started knitting. That hat in the top picture of this post? I’m making it from Red Heart. I feel the need to prove that I’m perfectly happy with cheap yarn. I can make something really pretty out of it. 49 Comments on "I’m Not a Yarn Snob (and I hate being called one)"
I, too, love the cheap(er) yarn and also have the stash (which I bet is bigger than yours) to prove it. Would love to see the pattern for that hat! It is gorgeous! I personally call people like myself “reverse yarn snobs”. I think I actually prefer the acrylic yarns. But its going to be looooong! I want a winter sleep hat, the kind that are long enough to wrap around your next. I would love to have the pattern for the hat, too. How can I find it? I’m working on it! LOL That is to say, its an original design and as soon as I’m done, I’ll publish. AND as always, there will be a freebie download code for my readers. 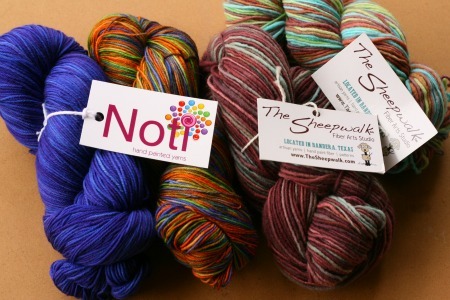 Just who had the audacity to call you a yarn snob? The fact that you spin your own yarn would qualify you in my book of being just the opposite. I too think that I have made some mighty nice items out of the lesser expensive yarns available. Lately I have purchased more real wool yarn than I have in the past but I have to live with the fact that most of it has to be hand-washed now too. C.est la vie! Thank-you. I do feel that way; I spin yarn because I’m curious about how yarn is made not because I’m picky or stuck up. So thanks for understanding. About the wool buying, maybe you are going through a phase? I went through a cotton phase once. I bought cottons, cotton-acrylic blends, cotton-wool blinds, and so on. That lasted for one summer I think and then it passed. But I didn’t curtail my urges at all. I am proud of my yarn addiction after all. Oh, trust me, I do understand yarn addictions! If I was getting a paycheck right now, I would be spending copious amounts on the after Christmas sales going on. I would like to knit (or crochet) something out of 100% Linen yarn but not sure where I can get some that isn’t exorbitant in price. Bravo to you for so eloquently voicing what many of us feel I’m sure. I have bins and bins of yarn-from RH to the pricey hand dyed varieties. They all have a reason to exist and become hand made stuff. I design a lot and use the cheaper stuff all the time while I knit then rip, etc it holds up well with this treatment! Also, knitting for charity and little people requires the workaholics in my stash. I love to knit and crochet, create beautiful, wearable things and the yarns I choose fit the need. Yarn lover, not yarn snob-that’s me! Exactly. And knitting/crochet should be a positive, creative experience. Why judge someone by the materials they use? It must have something to do with the culture that convinces women to buy $300 handbags (I don’t get that trend at all). Really that kind of soul-eating materialism has no place in our yarn-y world! 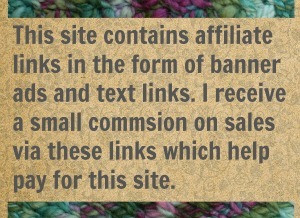 I adore yarn and have a stash of the good stuff, and spin, etc etc but I don’t like wool next to my own skin. For that reason and that grandchildren lose hats I recently tried soaking a RH project in hair conditioner overnight. It works! Soft as a baby’s bottom! !